How have you been and GSS for you so far? We would like to thank you very much for all your support and love all these while. And to put it in action, we would like to offer a 3 days only 40% storewide* discount (Except for classes, magazines, promotional items, buttons, ribbons, adhesives and pre order items) from 17 June 2011 to 19 June 2011. **Members only private sale. You will need to bring along your member card to be eligible to purchase at 40%. We regret that failure to do so will not be eligible to purchase at the special discount. On top of that, with a minimum purchase of $60 spent, members get double stamps on their card. Look at what the people at East Point are doing… They are having a great time ‘digging’ the $2 wagon and the $1 bin. 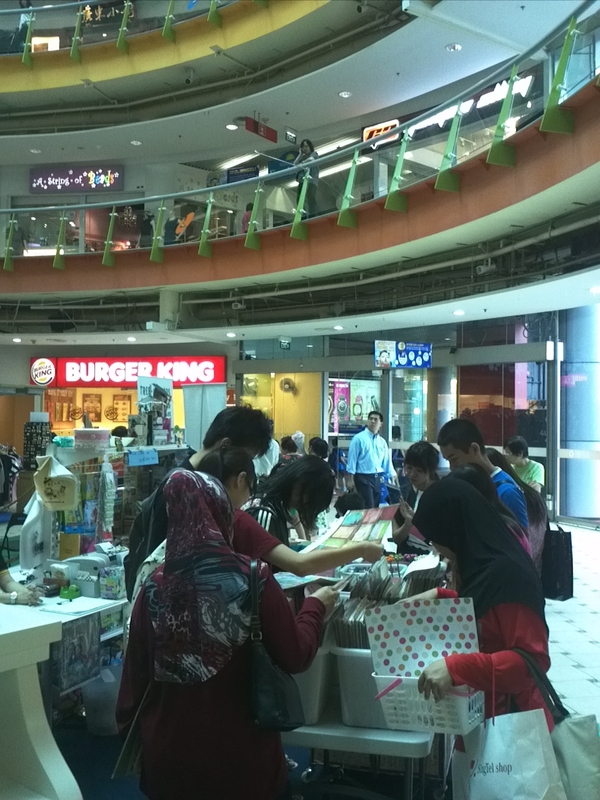 The kids are also having a great time bonding with their parents at the mini craft tables. So come on down and join us soon!! Thank you very much for all your support these 2 days. We will still be here till Sunday 12 June 2011. Do come on down and have some fun. The kids can have a go at the Forest Adventure and the younger ones and have craft session, while mummies can indulge in some shopping spree. We have added in more $1 papers and the $2 corner items. Stickles are now at $2 too. So hurry before they are all gone. What’s more, the $1 papers are at Buy 10 get 2 FREE or Buy 30 get 10 FREE. The $2 corner items are at Buy 10 get 1 FREE. So come on down soon before they are all GONE!!!! We are glad to inform you that we will be doing a roadshow in conjunction with Forest Adventure. There will be fun activities for your kids. So come on down and join us in the fun. Time : 11 a.m. – 9 p.m.
Siglap outlet will be closed from 6 June to 12 June 2011. We will be back in business on 13 June. Sorry for the inconvenience caused.